Mitchell Library, State Library of New South Wales, Sydney, Australia. Portrait miniature of Eber Bunker. Eber Bunker in this portrait wears a white waistcoat and white linen ruffled shirt each with stand collars, a white stock at neckline, and a navy blue wool double-breasted jacket with brass buttons. Watercolour on ivory miniature in gold frame with glass front, gold casing on reverse, knotted rope-like design around outside of frame, and a loop for hanging at centre top of frame. 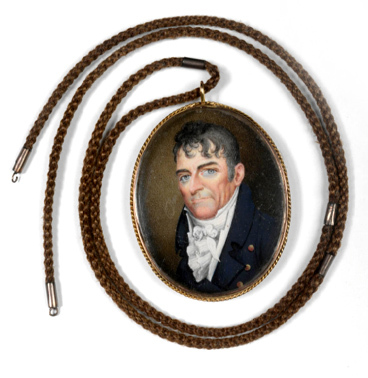 Brown coloured human hair, plaited into a chain with five clasps or joins accompanies the frame c. 1810. 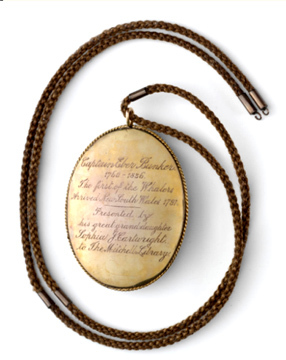 Engraved on the back of the frame is the inscription, ‘Captain Eber Bunker, 1760-1836, The first of the Whalers, Arrived New South Wales 1791′. Presented by his great granddaughter Sophia J. Cartwright to the Mitchell Library’. It is difficult to determine whether the hair chain was made at the same time as the frame. Dimensions: 74mm high x 60mm wide. When England lost its American colonies in 1778 in the American War of Independence, it began to look to the Pacific to replace these markets and resources. Joseph Banks, an influential naturalist and merchant, convinced the British government that breadfruit from Tahiti was an ideal crop to grow in the West Indies and use to feed slaves. Banks also argued that Botany Bay in New South Wales would make an ideal British port in the Pacific and that a settlement should be established with indentured convict labour. A penal settlement was also seen as a possible solution to the increasing problem of petty crime and a growing prison population in English cities. These problems were compounded by massive unemployment due to the ‘Industrial Revolution’. Food and materials once supplied from farms across the British Isles were now replaced by imports that were processed in mills and factories. British farm owners turned their land over to sheep grazing. They evicted farm labourers and their families, who, with no jobs and nowhere to live, flocked to the cities looking for work in the mills. Many resorted to petty crime to feed their families and indeed petty crime became a ways of life for many. Criminality was widespread because it was hard to catch criminals in the warren like streets of the industrial cities and there was not a dedicated professional police force. Despite this the few gaols there were started to fill up and a solution to the crime problem was sought. Despite it being a huge and very expensive experiment to set up a colony in an unknown land on the other side of the world, Britain decided to establish a penal colony at Botany Bay under the leadership of Captain Arthur Phillip. This was hoped to replace convict dumping grounds lost in North America, clear out the British gaols, provide a deterrent to crime in Britain and establish a deep water port in the South Pacific for Britain to expand its territories. The First Fleet of 11 ships, each one no larger than a Manly ferry, left Portsmouth in 1787 with more than 1480 men, women and children onboard. Although most were British, there were also Jewish, African, American and French convicts from Britain. After a voyage of three months the First Fleet arrived at Botany Bay on 24 January 1788. Here the Aboriginal people, who had lived in isolation for 40,000 years, met the British in an uneasy stand off at what is now known as Frenchman’s Beach at La Perouse. On 26 January two French frigates of the Lapérouse expedition sailed into Botany Bay as the British were relocating to Sydney Cove in Port Jackson. The isolation of the Aboriginal people in Australia had finished. European Australia was established in a simple ceremony at Sydney Cove on 26 January 1788. Between 1789 and 1791, the settlers at Sydney Cove were critically short of food. To make matters worse, the supply ship Guardian was wrecked off South Africa before it reached the Colony, and HMS Sirius, one of two of the Colony’s Navy vessels, was wrecked on Norfolk Island en route to China seeking food. In desperation, the HMS Supply, the Colony’s second Navy ship, was sent to Indonesia for food. Hopes were raised when a vessel arrived in Port Jackson in 1790, but it was not the Supply, but the Second Fleet of five ships carrying over 730 people. This Second Fleet was a disaster, with its human cargo severely abused and exploited by the private ship owners. Of 1000 convicts on board, 267 died and 480 were sick from scurvy, dysentery and fever. The supplies on board the Second Fleet were supposed to feed the convicts, but the ship owners withheld the supplies for sale until after the convicts disembarked. Phillip, enraged by this behaviour as he had to further ration existing supplies, became desperate to establish farms and a local economy. Farms, established with convict labour at Rose Hill (Parramatta) and later at Richmond and Windsor, were soon producing crops. Explorers set out to find new land and areas were opened up in the Liverpool area for market gardens, viticulture and sheep grazing for wool. These farms and pasture all depended on an abundant source of free convict labour to survive. Convicts were assigned to farmers under strict conditions known as the Assignment System. The colony was soon attracting entrepreneurs. Whale oil was in demand in Europe for lighting cities and lubricating the machines of the industrial revolution. After the American War of Independence the American whale oil market suffered because of the high tariffs placed by Britain on American oil. The resulting glut of oil on the American market stopped production there. Many American whalers migrated to London and served on British ships bringing out convict transports to New South Wales and then moving off to discover new whaling grounds in the Southern Ocean and the Pacific. The sturdy, wide beamed whaling ships were well suited as convict transports and five were chartered for the third fleet in 1791. The Master of one of these, the William and Ann, was Captain Eber Bunker. The William and Ann carried 181 convicts and a company of soldiers. Bunker took William and Ann and another vessel of the Third Fleet, Britannia on the first whaling expedition in Australian waters and returned with a whale each which they boiled and processed on the shore of Port Jackson. Bunker led a second whaling expedition to New Zealand and then retuned to Britain. Bunker returned to New South Wales in 1799 commanding the Albion which he brought to Port Jackson in the record time of 3 months and 15 days. After whaling in Australia for two years Bunker returned to Britain with a cargo of 155 barrels of whale oil. In 1803 Bunker return with the Albion and discovered the Bunker Islands group off the Queensland coast. The Albion was than chartered by Governor King to carry first settlers to Risdon Cove on the Derwent River in Tasmania. This led to a substantial land grant at Liverpool, New South Wales. After this voyage he brought his wife and children from England to Sydney in 1806. His home in Sydney was in the Rocks over looking the Harbour at a place known as Bunker’s Hill. Bunker was constantly at sea whaling until his last voyage in 1824 to the Santa Cruz Islands. Bunker built Collingwood House at Liverpool in 1810 the family moved there in 1811. 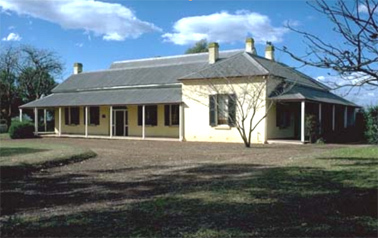 Here Bunker contributed to the development of New South Wales’ fledgling pastoral industry. Bunker was among the pastoralists to be granted permission to send stock and shepherds to the south and west of Bargo and Keepit on the Namoi River. Bunker established a regular supply of fresh meat to the Government Stores. Bunker died in 1836 at Collingwood. The watercolour has historical significance as a rare portrait and an object related to a figure from the early colonial period who brought skills and expertise that was crucial in developing the Colony’s fledging whaling and pastoral industry, thus ensuring the delivery of the Colony from hardship and its transformation into a flourishing maritime and pastoral economy that helped to build an expanding British global empire. The watercolour has aesthetic significance in the portrait of Bunker, the design of the frame and the practice of using human hair in keepsakes. The watercolour is significant for researchers as it is one of the few existing portraits of Bunker at all. Its design and manufacture make it a good example of a hand made keepsakes from early colonial Australia and Britain. 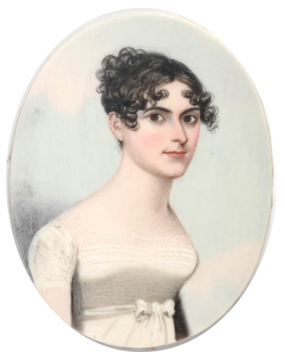 The watercolour has intangible significance being an iconic object and a symbol of Australia’s brutal convict origins and the development of the early settlement at Port Jackson. The watercolour is well provenanced and documented. It was donated to the Mitchell Library by his great granddaughter Sophia J. Cartwright and has been in the Mitchell collection ever since. The watercolour is extremely rare. It is one of a few existing portraits of Eber Bunker. It is also rare object from early colonial Australia. The object represents a time early in Australia’s history when the colony was still establishing itself and exploring its new environment. The watercolour also represents the coming of Europeans to Aboriginal Australia as it is instantly recognisable early 19th century keepsake from early Sydney. The watercolour is in excellent condition for its age and material. The watercolour interprets the near failure of the colony at Port Jackson in the 1790s and the role of entrepreneurs in the establishment, survival and eventual expansion of the early colony at New South Wales. It also interprets the change from the brutal convict origins of European Australia to a migrant based market based economy. Barden, S 1980, Collingwood: The home of Captain Eber Bunker, The Father of Australian Whaling, Liverpool City Council. Hughes, R 1987, Fatal Shore, London.